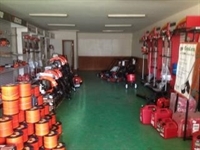 Landscaping equipment sales and repair services Long term established. For sale is all new equipment, parts supplies, client list, supplier relationships and goodwill. Ideal for small engine repair mechanic looking to start or expand your business. App 130K new equipment and more spare parts. 65% repairs, 35% equipment sales. Option to rent existing garage or move all to your location. Seller will assist as long as needed(on payroll).